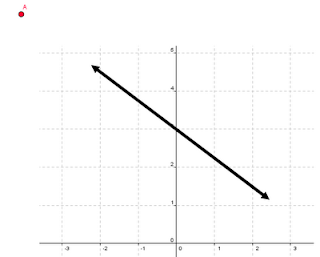 In my previous post, I described how we developed the Standard Form of a linear equation. 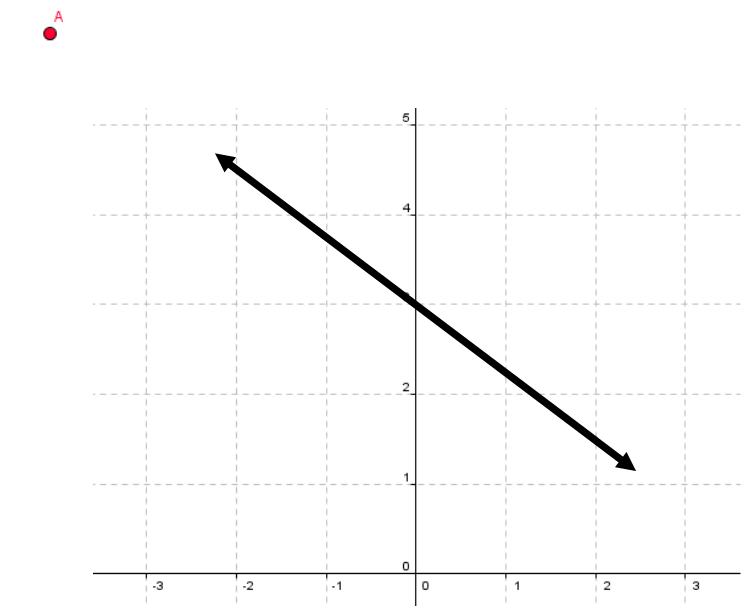 Students are already comfortable with using slope (rate of change) and the y-intercept (initial condition) to determine the equation of a line. We are currently spending a lot of time recognizing the rule of 4 and how each representation simply tells the same story from a different perspective. So, next I wanted to see what students would do with trying to decide whether or not a point is on a line. 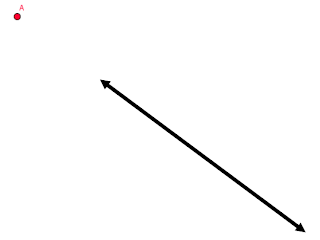 Question: Will the point go through the line? Students made their guesses and we split the room into the two camps: Yes and No. on how reliable the paper would be in determining whether or not the point is on the line. Are you sure about this equation? Nah, we need a bit more information. 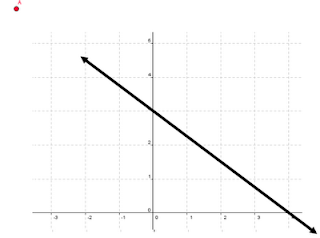 Now we have both intercepts; enough to verify our slope and enough to write the equation in Standard Form. But, do we have enough info to determine whether or not the point is on the line? Continuing with the pattern determined by the slope. Plugging the point into both equations to see if they are satisfied. The coolest part about this is that a colleague and I developed this lesson in about 10 minutes. It's pretty rewarding when minds get together and focus on interesting ways to deliver instruction centered around a simple question. Have to give credit to Dan for stoking the fire. So, the cheater was right! I think this is a good idea for a lesson because it asks students to refine their initial intuition, but I have some ideas for improving it. 1) Eyeballing the answer works way faster than doing the math. Your student knew the answer and then you demonstrate a longer, more complicated way of doing it. 2) The solution presented, imposing a coordinate system on the picture and then using that to find coordinates, is not the most accurate way to solve this problem! 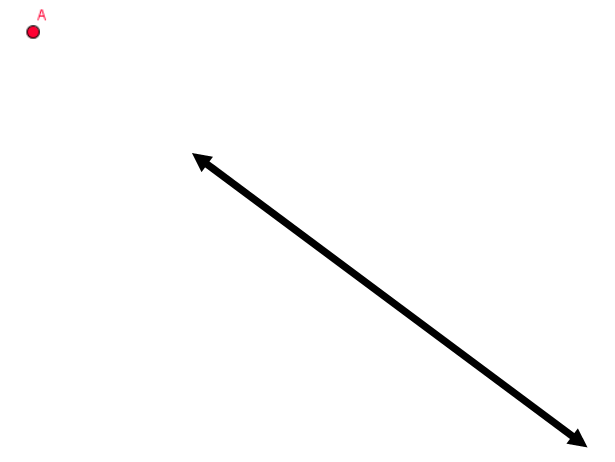 As long as we are assuming we can draw perfectly perpendicular lines with perfectly-spaced tick marks, let's just draw one of these perfect lines in the direction of the initial line and see if it includes the point! 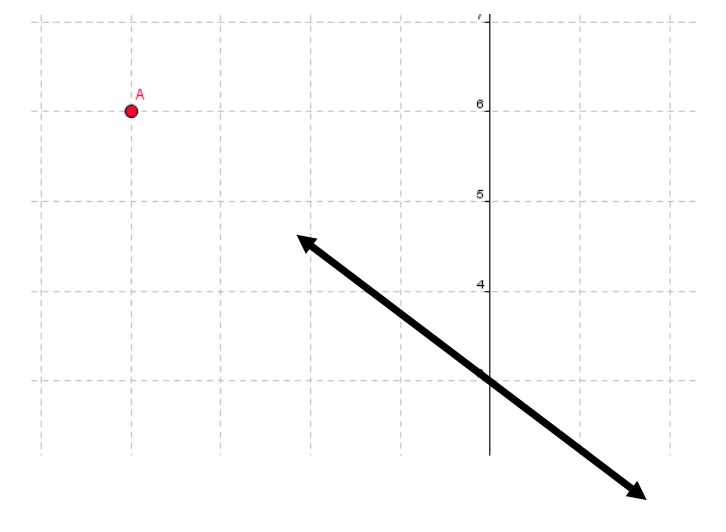 Why extend the line to get the x-intercept when you could just extend the line to (or past) the red point? So I'm trying to think of what scenario would have the great parts of your lesson (extrapolating, generalizing, measuring, formalizing) without the snags above. Could there be many points scattered about a graph and we have to see if the green ones line up? Perhaps all of our points are _almost_ collinear, and we have to find the line that goes through the most (some modeling application or something?). I wonder if there's anything that could be folded or cut out of paper here - cuts are nice because they are irreversible and a great reason that you have to be sure before you try something. 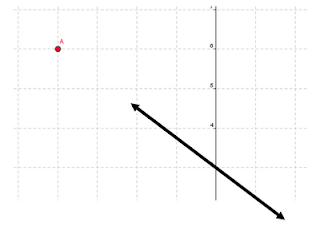 I really like this method of developing the algebraic way of figuring out if a point is on a line. I've tried out some of this logic in my geometry class. "Don't just assume that's a right angle." We even made up a class "rule" to not assume anything unless the problem or markings told us so. Here came my flaw: later on in the course, I wanted students to look at some geometric figures and assume certain things....basically because I was using the textbook problems. Had I created my own problems, this wouldn't have been a problem. So...I guess I wanted to share with your readers that Mr. Cox has a brilliant idea...but don't depend on the textbook to always help you out. Rock on, David. Sure, the easiest way to answer the question would be to continue the line. However, the things that we have been working on: standard form, slope intercept form and multiple representations seemed to fit quite nicely. I suppose there may be a better question to ask, but the idea hit at about 8:10 and I was on stage 45minutes later. So maybe I let the conversation serve the math a little more than I'd like. I'm curious as to what we really could do to incorporate all concepts I mentioned above in an even more organic way. But this sure beat the heck out of the textbook way of dealing with these. Thanks. I think I've opened the textbook 3 times this year. It has hurt a bit when it comes to practice problems, but I think we are building concepts a bit better than we've done in the past. The way you presented it was vastly superior to many ways I can think of - asking the students to ask themselves what information they need is fantastic. My problem is that you have ready to provide is artificial, because you might expect to be equally skilled at drawing diagonal lines as you are at drawing horizontal and vertical lines, and the student's suggestion with the paper is a better use of that skill. We could try to find some natural structure with a grid already on it. The pixels of your display come in strictly horizontal and vertical rows. The links in a fence form lines (are they perpendicular? maybe not. oh gosh - lines on a slanty grid?!). Maybe there's a sidewalk or a tile floor somewhere that we could write on with chalk or dry-erase markers? We could have many, many points, which would get tedious to measure one by one, and an equation would just make it easier? What if the class as a whole had to classify a list of 200 points as on or off the line? I re-read your first comment and I still don't see why my method was a "snag." Eyeballing may be faster and it definitely appeals to the student's intuition, but I fail to see how it's the most appropriate since there really is no way to verify. Continuing the line is definitely a method that would work, to find the answer. But that assumes that finding the answer is the only goal. I'm askind my students, "how many ways could we verify that our answer is correct." 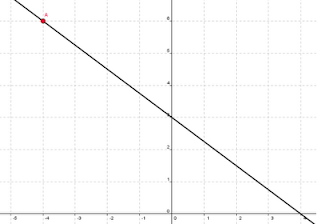 I'm not following your diagonal axis solution. You have to keep in mind that I'm dealing with 7th graders here. And we are still grappling with the Rule of 4. If you have the technology or skill to draw a perfectly straight set of axes, from which you can measure slope and intercepts exactly, then you also have the skill to draw a perfectly straight line at an angle, and just verify directly that the point is on the target line. All I'm saying is that the cheater used the idea you were going for, but chose a more appropriate axis. I hope it's clear that I think your lesson was a good idea, and a big improvement over static textbook questions. I'm trying to think of ways to polish it so that, for some reason, using a set of axes that is not along the original line is necessary. All of the ideas I've given are aiming at that goal. For another example, what if you handed out pieces of rectangular construction paper with the line and point drawn on one side? (Huge time investment, I know.) The students would not be able to fold exactly along the target line, but they WOULD be able to fold vertically and horizontally - a natural constraint of the paper. Then maybe from there there is some way to construct axes - folding each side in half, then in half again, etc, so we could make regular intervals without a ruler (having a ruler would obviate the whole problem again). Again, I thought your lesson was good. Thanks again for sharing with us! 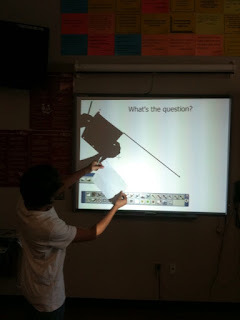 This is also a great opportunity to talk about the idea of drawing a "perfect" line or circle or coordinate plane etc. In reality, this isn't possible. Even a computer's nice looking circle becomes a jumble of jagged lines if you zoom enough. 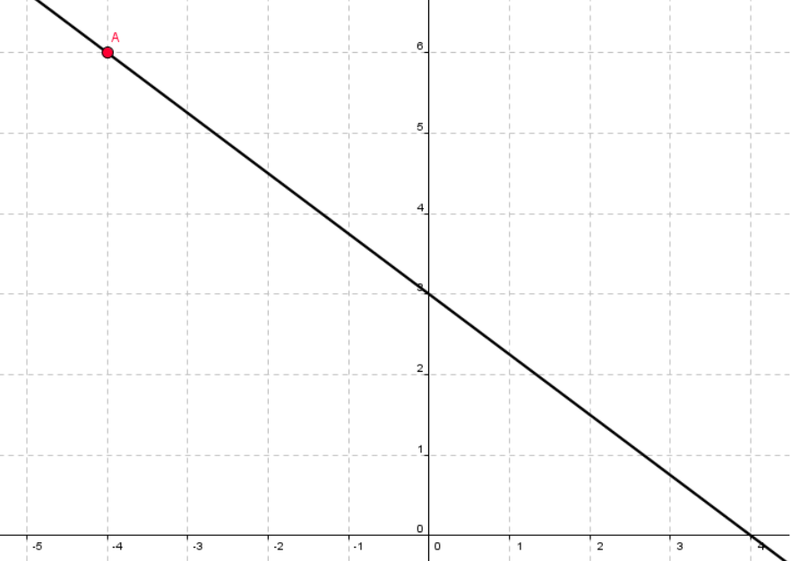 Mathematics discusses the abstract idea of a perfect line. It's good to experiment and measure, but you're doing science when you do this. You're doing math when you abstract your point and line, giving them definitions that define their relationship (and determine if they are collinear).